And A Player To Be Named Later: Is Bill Belichek Really A Coaching Genius? Even before the media recently began touting the fact that the Patriots have lost their last 3 playoff games—dating back to the Giants upset in Super Bowl XXLI—some football analysts began questioning whether Bill Belichick was really the football genius he is purported to be. The Patriots haven’t won it all since 2004, right? Is he really such a brilliant tactician? Or is he the victim of some great good luck? No, he really is that good. Really, really good. Belichick has a .714 playoff winning percentage, 9th all-time, ahead of guys like George Halas, Jimmy Johnson and Bill Walsh. His regular season winning percentage of .633 is ahead of Walsh, Curly Lambeau, Joe Gibbs and Tom Landry. Not too shabby, huh? On the other hand, while yes, he is a master tactician and motivator; luck can play apart of his success, can’t it? Consider this: Up until the day Tom Brady started as Bill Belichick’s quarterback, Belichick’s coaching record was 41-57. He’d had 1 winning season out of 6 that he coached and had been to the playoffs exactly once. Since Tom Brady is his starting quarterback, Belichick’s teams have won 3 Super Bowls, missed the playoffs twice—and one of those seasons was when Brady was out for the season with an injury—and have not had a losing season. During Belichick’s stay as Cleveland’s head coach, his quarterbacks were Bernie Kosar, Mike Tomczak, Todd Philcox and Vinnie Testaverde—who put together don’t equal Tom Brady’s left pinkie. 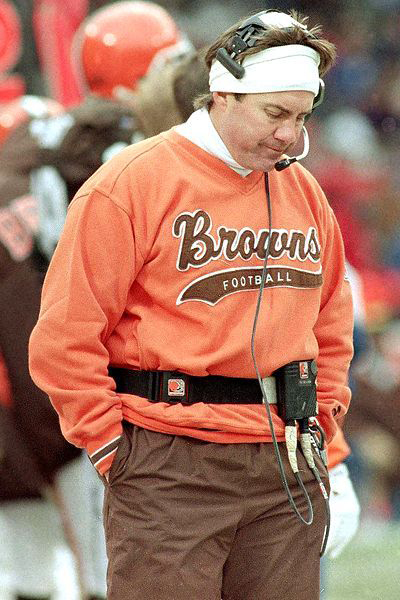 Belichick came in to Cleveland and found an aging team, past its prime. Belichick tried to dismantle the team—including a very public and controversial dumping of beloved Bernie Kosar—and build the team the way he wanted it to be. But Belichick had one major problem—he didn’t have the unconditional backing of Browns management, nor did he have someone to work closely with to get the players he wanted. Belichick knew that Kosar was done as a quarterback, but didn’t have a GM like Scott Pioli to help him find his Tom Brady and convince management to select him. 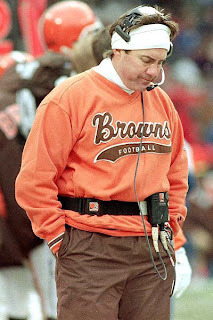 The Browns organization had a number of football czars who each wanted different directions for the team. The result: chaos. In New England, Belichick did have Scott Pioli—who worked with Belichick from the exact same script—to build a team from the ground up. From the time he took the Patriots out onto the field Opening Day 2000, to the time they won the Super Bowl at the end of the 2001 season, player turnover was the name of the game in New England. Drew Bledsoe was replaced by Tom Brady. Richard Seymour, Matt Light and Greg Randle were drafted and starting. Belichick favorites Anthony Pleasant, Bobby Hamilton were brought in to start as was Otis Smith, Roman Phifer, Mike Compton, Antoine Smith, Marc Edwards and Mike Vrabel. Quite a turnover......and it worked. The Patriots shocked the football world by winning the Super Bowl that year. Some coaches—Mike Holmgren leaps to mind (Marcus Tubbs, Lamar King, Koren Robinson, Chris McIntosh, Ike Charlton)—are yes, extremely innovative and successful at the coaching aspect of the game. But they can’t scout a player who would mesh well into their system, with any accuracy. Belichick can. 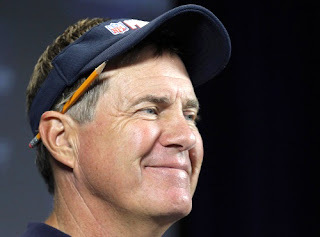 As to why Belichick hasn’t won it all since 2004. Well, expecting to win it all every season, especially in a league with Peyton Manning and Ben Roethlisberger, is kind of ridiculous. All Belichick has done since 2004 has compile a 73-23 record, including a season where Tom Brady was out with a injury. He was also 2 minutes—and a God-produced miracle pass—away from another Super Bowl and the first perfect season in modern football. So, yes, any coach with 3 Super Bowl rings is a genius. But what helps Belichick’s genius, is what prevented Belichick from succeeding in Cleveland. Being able to select the players to run his system. And it is what will keep New England competitive for a long while into the future. While many relish in the loss to the J-E-T-S and call the 3 straight playoff losses a trend will get burned. They had (I think) the youngest defense in the league. He overhauled the team and with a few years left in Brady's tank he will make a couple more runs at titles. I think you hit it on the head, in the era since salary caps and free agency in the NFL it is the closest thing to a dynasty. Teams can reload quickly if they are smart. Look at the Falcons, sure they lost big time to Green Bay the other night. They weren't even a train wreck in 2006 when Mike Vick and Bobby Petrino broke the team. They've rebuilt a very clean/generic team and have done well. They have good talent (and a disciple of Belichek at GM)and will continue to get better. Wins are wins. The NFL is built for parity, so any team that can string together 3 Super Bowls in under a decade has done an amazing job. The fact that the Patriots often trade their higher picks for more picks in later rounds and still wind up with talent amazes me. They don't want high priced rookies coming in and disrupting their system, so they bring in hungry players. It's smart and it obviously works. The Jets simply outplayed the Patriots...it happens. They ran the ball well and Sanchez didn't turn the ball over.